The Daily Express Building is a striking Art Deco building located at Great Ancoats Street in Manchester, England. It is one of the three buildings that house the Daily Express offices in the country. It is notable for its timeless design despite its age. People will not know by its design that this building was completed in 1939. Although no longer occupied by the Daily Express, it still uses the same name as when it was completed. 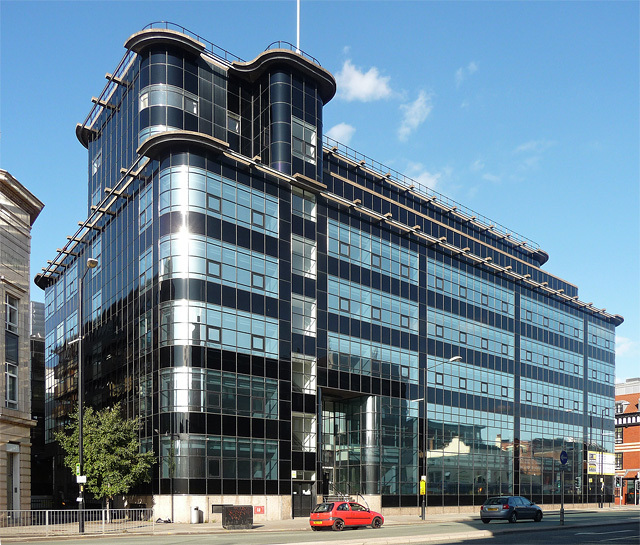 The Daily Express Building in Manchester was planned due to the lack of office space to accommodate the needs of a growing Daily Express in the 1930’s. During that time, the Daily Express is the most circulated paper in the world. The owner of the Daily Express commissioned three buildings to be built in London, Glasgow and Manchester. The Daily Express Building Manchester was designed by notable engineer Sir Owen Williams, who was the engineer of the three Daily Express buildings. Construction for the Manchester building started in 1936. It was completed in 1939. Subsequent renovations were made in 1960, 1979, 1983 and 1993. The Daily Express Building is noted for its futurist Avant Garde design. Although known as an Art Deco building, the Daily Express Building in Manchester is more associated with the futurist streamline modern architectural style with its horizontal lines and curved corners. Its modern design makes the building look younger than it actually is. The structure is clad with both opaque and black vitrolite glass. It was one of the very first buildings to incorporate curtain walling. From the outside, it was one of the first buildings to have an all-glass front, especially making it even striking when lighted up at night. The building contains six storeys, with the top two storeys added in 1979. The building also has a seven-storey tower at the left end. The Daily Express left the building sometime in the 1980’s. It is now used as a mixed apartment and office block. Because of its striking design and timeless character, the Daily Express Building was listed as a Grade II building, indicating that it is a building that is particularly significant of more than local interest. It is said to be the youngest building in Manchester to be listed as a Grade II building, given in 1974, just thirty-five years after its initial construction.